As a plant manager, you’ve heard debates about steel vs. plastic strapping for your packaging needs. There are arguments both for and against either material. Some people will point out that steel can be used for even the heaviest of loads, while others argue that it has a tendency to corrode if it’s left outside. Plastics are strong and flexible, but they might not be the right choice for every load. One thing you’ve likely thought less about are the key differences between steel and plastic strapping tools. While everyone’s busy debating which material is best to use, less attention has been paid to the tools you need to use for either type. You probably know that you can’t simply switch out one material for another. Both plastic and steel strapping require their own tools, and the differences between them highlight why. Both steel and plastic strapping can be dealt with through various means. However, many plants still use manual and plastic hand tools. Steel can be sealed using clips or notches. Clips are applied using manual tensioners and sealers. Notches can be applied using a manual all-in-one tool or through air-driven pneumatic tools. Plastic can be sealed using clips, buckles, or welds. Buckles can be used with no tools but generally are only used for light-duty polypropylene. Welds must use either a pneumatic or battery-powered tool. Battery tools allow mobility, and air tools must be used at fixed locations. 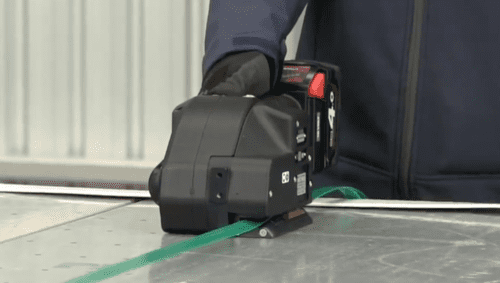 If you look only at handheld equipment for strapping, you might be surprised by the lack of options when it comes to the ones designed to work with steel strapping. There are essentially two types of hand tools designed for steel strapping, manual and pneumatic. Manual tools consist of tensioners, sealers, and shears. Those are three separate pieces of equipment to accomplish one task; however, there are all-in-one tools that are quite popular. They notch the strap, don’t require seals, and do everything in one step. Yet, these tools are often heavy and difficult to use. They’re also more dangerous, and your team members have to be trained properly to use them to avoid injury. Pneumatic tools tend to be easier to use. They’re air operated, but they are not very mobile, and you must provide good-quality, clean, moisture-free air for these tools to work without issue. Although they’re safer than manual tools, using steel strapping can still be difficult. You have to be sure to use quality strapping to help your team avoid injuries. You can still use manual tools for plastic strapping. These tools are often small and more affordable. They’re also quite similar to what you may have been using for steel strapping, so your workers are already familiar with them to an extent. However, manual tools for plastic strapping must use clips as the plastic cannot be notched as it can be with steel. Battery tools for plastic are the key difference maker between steel and plastic strapping. Battery tools offer the mobility you simply can’t achieve with steel using power-driven tools. They also reduce the number of tools you need. They’re easier to use, with your team merely moving the tool into place over the strap, adjusting the tension, and sealing the strap. Plastic strapping is safer than steel strapping, and using pneumatic tools makes the process that much easier and safer. As mentioned, you can also automate the strapping process with plastic strapping solutions. These machines are more efficient and productive than even the most efficient team. As mentioned, plastic strapping is often safer than steel strapping. In many cases, it’s the right choice for what you’re packaging. Plastic strapping is often just as strong and even more flexible. Steel should only be used in certain cases, such as when you’re packing extremely heavy loads. The material itself and the plastic strapping tools you’ll use with it are often more cost-effective solutions as well. If you’re wondering what’s right for your plant, get in touch with the experts. Daryn Radke has been a sales agent with FROMM Packaging for over three years. Daryn came to FROMM with over 30 years of manufacturing and consulting experience in all aspects of operations. This includes roles as a production analyst, business development manager, materials manager, plant manager, supply chain consultant, and business owner in software integrations. Daryn currently uses this well-rounded expertise to consult with his customers in packaging solutions to improve the effectiveness of their operations. Daryn is certified in Six Sigma, Organizational Design, Quick Changeover, Taguchi Design of Experiments, Material Management, and Strategic Business Planning.